Craft Arena: Never enough books! I had a delivery of books in today and I still have room for more! I've just put them out on the shelves (those that haven't been sold whilst I was putting them out - it just seems that one sniff of a box of brand new books brings people out of the woodwork!) One of the problems is that some of them are now destined for my personal library. I can totally understand that, you can never have enough books, as I keep telling my grand daughter! These are my favourites from those that arrived today. Some of them are new and some old friends. I've done a little collography in the past and it is something I've always wanted to come back to. This book will help me take things further. 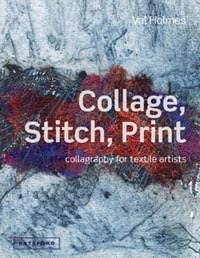 This comprehensive guide from one of Europe's best-known textile artists and teachers contains everything you need to know about the exciting effects you can achieve using the almost endless permutations of collage, stitch and print, and how you can incorporate them into your own stitched-textile work. Includes invaluable information on making a collagraphy plate using embroidery, choosing suitable surfaces for print, combining paper and fabric, embroidering onto prints, and how to work in series. 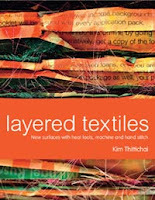 Illustrated throughout with the best examples of contemporary collagraphy in textile art, this book is a fascinating introduction to a technique that could become your latest textile-art passion. Those of you who know me, know that I do like a bit of texture in my work. This great book will certainly help do that! Quilt art doesn't have to be flat. These days, the most innovative quilt artists are creating intricate raised stuctures, using various folding, gathering, pleating, stuffing, padding, shrinking and layering techniques. 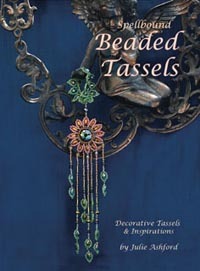 This fascinating book is a guide to creating these stunning effects, from the simplest textured quilt to elaborate twisted and embellished three-dimensional structures, including vessels and hanging installations. Popular quilt artist C June Barnes, author of Stitching to Dye in Quilt Art, reveals the secrets of how these sometimes impossible-looking structures are put together, giving invaluable technical construction tips and a wealth of inspirational examples, including work from some of the world's leading quilt artists. 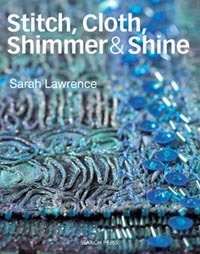 I do like a bit of bling and this lovely book certainly has a lot of it! Yet another for my bookshelf. It is packed full of projects. All of which have detailed recipes and fully illustrated step by step instructions, and all are graded for difficulty. All the basics are explained from terminology to techniques. Design ideas and inspirations throughout plus useful hints and tips. Full colour throughout including lots of photos. Sarah's untimely death left a big hole in our lives, but this book is a reminder of her talent as well as giving inspiration and ideas for lots of lovely shiny textile projects. Always popular, this book is now back in stock. If you haven't got it yet, you must! This is what I call a 'messing about' book. I never tire of looking through it an drooling over the techniques Kim uses. The techniques are always good for playing about on a cold rainy day and then you can incorporate them into some fantastic texile art. From newspaper to more modern materials, this gives a good grounding in using these sometimes bewildering substances to give emphasis and texture to your work. Kim features some wonderful pieces of work from other textile artists too. Another must have. I've got lots of lovely new crochet books too, but I haven't decided which to keep for myself yet!